Shifting the morning assembly of students indoors, mandating them to wear masks during outdoor activities and distributing gooseberries are among the measures taken by schools in Delhi and adjoining areas to deal with the alarming level of air pollution. With Delhi's air quality expected to deteriorate further post-Diwali, several schools have started taking precautionary measures. "We have quality filters in place because of which all our classrooms receive treated fresh air throughout the working hours and a professional team is monitoring this," said Deepa Kumar, principal, Heritage Xperiential Learning School, Gurgaon. "We are also closely monitoring and recording PM2.5 (particulate matter) levels, with checks being conducted every few hours. This information helps guide our outdoor activities," she said. The air quality in Delhi has oscillated between 'very poor' and 'severe' for nearly three weeks now. On Sunday, it showed some improvement to fall in the 'poor' category but experts believe the situation is likely to worsen after Diwali. Fine particulates can be a matter of serious health concern than PM10 (particles in the air with a diameter of less than 10 micrometres). Kumar said the school administration at times has to cancel outdoor sports activities. "If needed, we conduct appropriate activities inside the classes during the sports hour during the day," she added. Ashok Pandey, principal, Ahlcon International School in Mayur Vihar, said, "We have shifted the venue of morning assembly indoors and advised parents to send their wards wearing masks so whenever they are outdoors they have limited exposure to toxic air". Suraj School in Gurgaon has started an initiative to distribute gooseberries to students, which, according to health experts, minimize effects of air pollution on lungs. "We are advising students to regularly eat the fruit and have also been distributing it in school," said Kanika Ghai, vice principal of the school. Amita Wattal, principal of Springdales, Pusa Road in Delhi, said the school is organising campaigns to make students aware of the hazards due to firecrackers ahead of Diwali. "We are encouraging students to celebrate 'green' Diwali and say no to crackers as they also add on to the pollution. We have shifted sports and cultural practices indoors as post Diwali the air quality usually dips," she said. 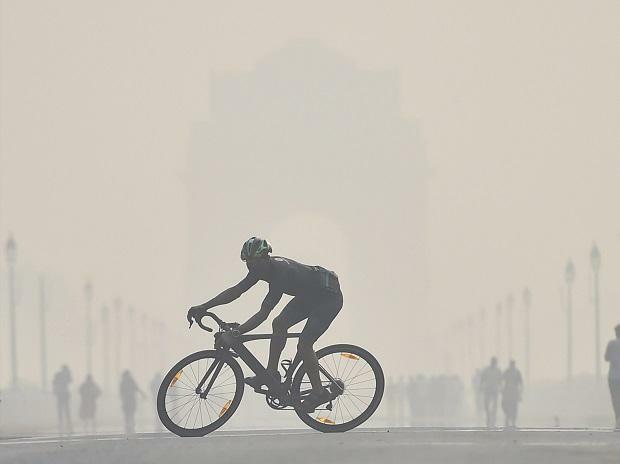 Amid a rise in health-related problems due to increase in air pollution in the national capital, Union Environment Minister Harsh Vardhan Thursday launched a manual on asthma detailing how school administrations must behave in case of an emergency. Delhi's Directorate of Education (DoE) is yet to issue an advisory in this regard. "We are waiting for a direction from Graded Response Action Plan, after which an advisory will be issued to all government and private schools," Sanjay Goel, DoE director, said.